Who can argue or debate about the importance of a staff party for business growth with a man who has built up an empire, not on blood and sweat but upon the happy tears and beers of his team? Year end parties have become increasingly important and have evolved over the past few years, with companies like Google and Amazon leading this evolution. The cheese platter and a bottle of wine in the office kitchen aren't going to cut it these days; staff expect and deserve more. There are many alternate and exotic year end party ideas out there that you can choose from; however, we would strongly recommend hosting a stay-over. An orthodox year end event is usually a dinner or lunch, and quite often, the CEO or management will stay around for a drink, give a speech and then head out. They will not stay for the lunch or stay on to mingle with the team. To employees, this constitutes as disrespect and also clearly illuminates the organization's hierarchy. Having a stay-over allows everyone to get to know each other better and dig deeper than just the surface. Getting to know someone over two hours is rather different to getting to know someone over two days. This shows that the management team are genuinely keen on learning more about their staff and that the event isn't just a tick box exercise. The profound and meaningful conversations that are had around the pool or fireplace in the early hours of the morning, and what you can learn from those conversations can't be replicated in any other setting. The notion of seeing someone, like a boss, the first thing in the morning, at the same breakfast table also breaks down all semblance of hierarchy and barriers and lets the staff know that he is accessible and approachable, no matter what level they are on. At first glance, this may seem a bit light, but there is more to safety and sanity than you think. More than just being worried about members getting home safely at odd hours of the morning or evening or if they are sober enough to get themselves home in one piece, management should be concerned with what happens after. It isn't the organization's responsibility, but it should be done out of compassion rather than obligation. Rather than someone going home and waking up with a hangover the next morning and wondering if they made a fool of themselves the previous evening; have everyone stay over and wake up to their hangovers together. If people got a bit carried away and had too much to drink during the festivities, have a chuckle about it and move on. This will ensure that everyone feels comfortable to come back to the office without feeling embarrassed and uncertain as to what others may think and also, so they don't stress about their behaviour. The party is meant to be a safe and non-judgemental space for everyone to let their hair and guard down. Leaving the year end function without feeling assured and without an amicable parting with team members would defeat the purpose of the entire event. A stay-over year end function, with the organization as a whole, sets the tone for a free-spirited and fun-loving kind of company culture. People who don't regularly interact with each other can do so, and because there's no rush, it gives them more time to bond. Just like families bond during the holidays, teams can do so over a weekend getaway. Sharing rooms, waking up to watch a sunrise and splashing about in a pool and playing cards on the beach are just a few family type activities that teams can partake in during a year end stay-over. The bonding that is done between team members during these stay-over events is way more meaningful than one done over lunch, and this will present itself in the office environment. Once back at the office, team members will be more aware, understanding and compassionate to each other as they know each other more intimately and on a more casual level. These are just 3 of the many reasons why a stay-over year end function is more impactful and rewarding than other types of year end functions. 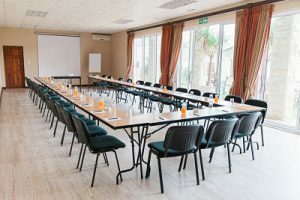 A team that feels appreciated by management, a workforce that gets along well with each other and a sense of camaraderie within the organization are just a few of the benefits that a stay-over year end function will allow you to reap. To capitalize on these benefits start planning your year end function stay-over with us today.